If you've listened to young parents talking about all their experiences with their children with a sparkle in their eyes, you will know that children are the greatest gift life can bring. 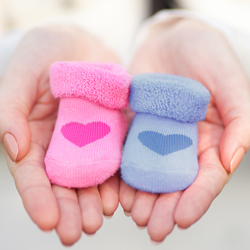 The mere anticipation of a pregnancy gives you a small foretaste of all the wonderful experiences that lie ahead. Take your time though because not everything works perfectly the first time you try – and the same is true of a pregnancy. If you approach the issue in a calm and collected way, you will be able, along with your partner, to become accustomed to the idea of a life with children and to reappraise old habits. And here's another little tip if you think you are pregnant: Keep your little secret to yourself for a while until you can be absolutely certain, and then you can quietly enjoy anticipating the arrival of your new child. Our MAM fertility calendar helps you to work out your fertile days quickly and easily! Are you trying for a baby? MAM offers you a little bit of help if you're trying for a baby: The fertility calendar helps you to work out your fertile days quickly and easily. Simply enter the first day of your last period and the length of your menstrual cycle*. But please do not use this "the other way round" – this method is not a suitable method of contraception. Please enter the first day of your last period (Day-Month-Year).